very vmall foot-print compact all-in-one POS system - Everything you need: receipt printer, cash drawer, scanner, ID card reader with a 15.6'' widescreen touchmonitor with full HD resolution and available with an Android or iPad docking station so it's perfect for retail and very interesting for hospitality. Elo PayPoint ® Plus for Android system. More compact, more elegance and more advanced than nearly every cash register, without losing the integrated advantages – that is what the Elo PayPoint from Elo Touch Solutions offers you. The all-in-one system scores big with everything that is indispensable at the modern checkout, including the fully integrated peripherals: cash drawer, receipt printer, barcode scanner and magnetic stripe reader. This makes the Elo PayPoint more than just an eye-catcher with its great look; it is also a fully-fledged POS system with a minimal footprint. The 15.6" widescreen touchmonitor with full HD resolution offers plenty of leeway for an optimal user interface – no matter whether you choose the version with an integrated Android tablet or the alternative with an Apple iPad docking station. 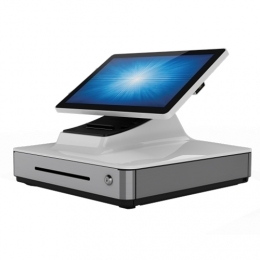 Don't forget the practical extras for the day-to-day in retail: both the display and the docking station feature a flip-to-sign touchscreen for obtaining the customer's digital signature. A 3-year manufacturer's warranty speaks for the quality of the product, plus it additionally secures your investment. PayPoint Plus for Android is an all-in-one mPOS solution that brings simplicity and elegance to the point of sale with powerful Qualcomm® Snapdragon™ processing and an Android 7.1 Nougat OS. Offering sleek, modern style with peripherals built in, PayPoint Plus for Android integrates a 15.6-inch TouchPro PCAP touchscreen, 3-inch Star receipt printer, industry standard 16-inch cash drawer, Magtek MSR, Honeywell 2D barcode scanner and a customer facing display*. 3rd party peripherals can also be added through one of the many I/O connections, allowing for an EMV payment terminal, second cash drawer or scale if needed. PayPoint transforms traditional POS into a beautiful and functional space-saving solution to help you to better serve your customers. The flip-for-signature screen encourages shopper engagement and electronic receipt delivery. And, with its single cable design, PayPoint makes setting up the point of sale system fast and easy - just unbox, plug in, connect, and go. Select Product * Please select product Elo PayPoint Plus for iPad, MSR, Scanner (2D), white Elo PayPoint Plus, 39.6 cm (15,6''), Projected Capacitive, SSD, MSR, Scanner, Win. 10, black Elo PayPoint Plus, 39.6 cm (15,6''), Projected Capacitive, SSD, MSR, Scanner, Win. 10, white Elo adapter, RJ45 to RS232, 10 pcs. Elo adapter, RJ45 to RS232, 10 pcs. Elo spare key, 25 pcs. Elo spare key, 25 pcs. Elo spare key, 25 pcs.